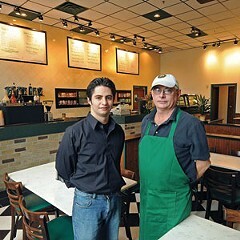 Jeff and Steve Austin hope to draw weekday breakfast and lunch traffic to their new business, Canal Cafe, downtown. The underutilized but architecturally rich area around Haxall Point downtown has two new faces hoping to draw people in. Steve and Jeff Austin, father-and-son owners of the just-opened Canal Cafe, hope to put personal service to work in an area ripe for more foot traffic. Theirs is the 30-seat space that held McAllister&apos;s Deli until last year, just behind BlackFinn in the Troutman Sanders building. Canal Cafe retains most of the deli&apos;s interior fittings, but the menu extends to breakfast and promises quicker service at lunch. Steve Austin knows the need for speed — he ran a factory cafeteria in New York for 20 years; his son is a fixture on the fine-dining circuit here. Once good weather hits, the generous terrace beneath Riverside on the James should help draw in customers for outdoor dining. “This is quick, healthy, grab-and-go food — hearty but simple,” Jeff Austin says. “We&apos;re not experimenting. We&apos;re not reinventing the egg.” Instead they&apos;ll serve build-to-order breakfast sandwiches and platters, locally roasted coffee, daily panini such as the pastrami mushroom melt and the batteau cheese steak, and fruit smoothies, frappAcs and pastries. Open weekdays from 7 a.m.-3 p.m. at 1001 Haxall Point. 303-3345. Gone today: In one of the fastest turnovers in local restaurant history, the Fan corner spot Friend or Pho has been sold to the owners of across-the-street neighbor F.W. Sullivan&apos;s. Lady N&apos;awlins Cajun Cafe, now open for dinner and bar hours nightly, includes po&apos;boys, oysters, gumbo, jambalaya, gator bites and crawfish fritters. For more about the changes, click here. Mingles New location for Caribbean-inspired seafood, curried goat, oxtail, meats, sides and desserts. Bar. 1726 E. Main St. Lunch and dinner Tuesday-Sunday. 780-0013. Nate&apos;s Taco Truck Stop Local favorite takeout tacos, tamales, burritos, spicy hot chocolate. Breakfast 8:30-10:30 a.m., lunch 11:30 a.m.-3:30 p.m. weekdays only. 315 N. Second St. 562-1227. The Crazy Greek Offshoot of Staples Mill classic; gyros, pizza, panini, spaghetti, seafood and steaks. Full bar. Lunch and dinner daily, large dining room and outdoor seating. 11500 Busy St. Midlothian. 379-8941. Off the Hookah Egyptian dAccor, falafel, hummus, gyros, kebabs, fresh catch, cocktails and flavored smokes in an exotic club setting. Weekday lunch, dinner and bar Mon. — Sat. 140 Virginia St. 225-1918. offthehookahva.ning.com. Grandma&apos;s Soul Food Restaurant Longtime takeout spot with small eat-in; fried chicken, chitterlings, pig&apos;s feet, lake trout, sides, scratch-made desserts. Dinner daily, lunch Tuesday-Sunday. 3828 Walmsley Boulevard. 714-0401. CLOSED: Bistro 104, Bubbling Restaurant, Summer Shack, Caribbean Mingles. Chris Mattera and Brad Hemp of SausageCraft are fending off a lawsuit from their former employer at Belmont Butchery. It&apos;s become a bit of a turf war, and the turf is sausage. Last month&apos;s Style Weekly cover story on the area&apos;s growing artisan-meat culture featured Tanya Cauthen of Belmont Butchery and two former employees, Chris Mattera and Brad Hemp, who now own the wholesale business SausageCraft. Just as that story went to press, Cauthen&apos;s lawyer served notice that a lawsuit was in the works, seeking an injunction order against the new business. That injunction was denied and the suit now goes to court unless a settlement is reached. While that may not be clear, the financial implications are. With the specter of punitive damages potentially in the $7 million range, according to SausageCraft&apos;s attorney Devon Cushman, the new business could tank before hitting its second quarter. At issue is proprietary information, and what constitutes a trade secret. Sausage making “is my craft, but it isn&apos;t rocket science,” Mattera says, “it&apos;s sausage, people.” Cauthen says the point of the suit is how the deal went down. “This is a breach of trust. If I didn&apos;t feel there was wrongdoing, I wouldn&apos;t have chosen this course. To find out my trust was sorely misplaced, it&apos;s tough. It&apos;s the details and the way it was done. I left the two of them in charge [at Belmont Butchery] because I was on my honeymoon. [Sausage wholesaling] is what Belmont Butchery was going to be doing next, so it&apos;s a loss of growth opportunity. My desire when they announced what they were going to do was set some rules, some parameters of how it would work for everyone. I told them exactly how I felt,” so that the lawsuit was not unexpected. “It doesn&apos;t make any of us look good,” Cauthen says, vowing to keep her business moving above the fray. Last year, Billy Bread and Richmond Restaurant Week stirred up issues of ownership in the local food community. When are recipes and techniques trade secrets, and should fundraising events be invitation-only? Legal answers might differ from public opinion, and this town&apos;s not lacking that. Watch this space for an update as the case is resolved. 2011 says you're not full yet. The new year brings an exotic aesthetic to Shockoe Slip with the opening of Off the Hookah on the Canal Walk, the third in a Florida-based chain of nightclubs. Off the Hookah: Juggling bartenders, belly dancers, flamenco music and beds to lounge on — here&apos;s a new use for an old hat factory in a once-stodgy city. Easily the most decorative project in the works is this club in the Lady Byrd building on the Canal Walk. 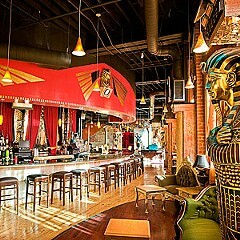 Situated at street level above the restaurant Current, this nightclub will attempt to give Richmond a link to Fort Lauderdale and West Palm Beach, where sister clubs wear the same Egyptian theme and sometimes have a celebrity in the crowd. Mediterranean food, a full sushi bar, lots of cocktails and two-dozen flavored smokes are the draws, or is it the beds and cabanas that are piquing interest? Dinner and bar nightly, coming soon to 140 Virginia St. offthehookahva.ning.com. Boom Boom Burgers: Locally sourced meat and hand-shaped patties drive this new Shockoe Bottom business at 1703 E. Franklin St. Look for the dynamite logo and bright neon colors as work progresses. boom-booms.com. Pasture: Construction bids start soon for this project in the former Montaldo&apos;s building on East Grace. Co-owner Ry Marchant says the 100-seat restaurant, with chef Jason Alley&apos;s Southern regional recipes filling the small-plates menu, should be on track for a late-summer opening. New project manager Bill Chapman is carrying the renovation forward, Marchant says, and brings energy and expertise in historic renovation and restaurant planning. Look for a big bar next to big windows in a downtown block that deserves attention. Cupertino&apos;s Bagels: Delays kept this downtown breakfast and lunch spot from opening in December as hoped. Look for an early 2011 entry in the bagel-sandwich field at 1215 E. Main St. It&apos;s owned by Walter Baietti of the West End&apos;s mother ship. Conch Republic: Also under construction is this casual spot in Rocketts Landing, just south of the Boathouse restaurant and offering boat-up service and a Key West-themed, multilevel environment with decks, drinks and mid-priced eats. Owner Bob Cox says construction is nearly complete and an early April opening is the goal. Enoteca Sogno: Fans have been waiting for the return of Gary York&apos;s wine bar, set to open at 1223 Bellevue Ave. in a renovated space that&apos;s larger, comfier and able to support an extended menu of Italian classics, well-chosen wines and an emphasis on neighborly affordability. Hermitage Grill: After a fire last year, this longtime meat-centric spot is under construction with no word yet on an opening date. TBD: Buttermilk Palace, as owner Kendra Feather has nicknamed her new project, comes to life by spring in the former Que Pasa restaurant. Feather&apos;s success (Ipanema Cafe and Garnett&apos;s) makes her a shoo-in for neighborhood devotion in the new spot, regardless of its official name. Corner CafAc: Like so many projects, this one&apos;s taking its time to reopen. When it does, look for a shiny new kitchen, finally-clean windows and a general freshening, for a neighborhood hangout with familiar faces at the bar and daily specials on the menu. TBD: Style Weekly architecture critic and senior contributing editor Edwin Slipek Jr. says a mystery project in the Fan will bring something new to local restaurant culture this year. Watch this space for the whos, whats and wheres of a couple of operations still being held close to the vest, but hoping to capture diners&apos; interest. Jaks Bagels & Deli: About to open at 3443 W. Cary St. with daily breakfast and lunch sandwiches. Parkside CafAc: It didn&apos;t open in 2010 and awaits its introduction to Woodland Heights next door to Crossroads Coffee & Ice Cream on Forest Hill Avenue. Advance interest in this chef-owned project is solid, and as usual, patience is required. Crust & Cream: A former mechanic&apos;s shop in Westover Hills is almost through the construction phase and scheduled for a late-January opening. Owner Redwan “Rod” Saif says the place will be family-friendly, with takeout and delivery and about a dozen seats in the bright corner spot. A specialty will be Philly cheese steak sandwiches “with meat we cut, made to order while you watch,” Saif says. A foot-long Philly sub will cost $5.99. Other menu items will be soft-serve ice cream and frozen yogurt (coming in spring) and sandwiches, pizzas, chicken and seafood salads in the case, with a range of desserts. 4610 Forest Hill Ave. 230-5555. Benny&apos;s BBQ: This Stratford Hills success story with a loyal following is about to move to larger quarters farther west. Benny&apos;s BBQ has a new home in Bon Air at the Stony Point Shopping Center in the former Belle Kuisine space. Asian Galaxy: Japanese and Thai food are promised at this redesigned eatery, formerly a Planet Wings, at 7048 Forest Hill Ave. Construction is slow-going, as are details about the project. Chicken Mania: Peruvian and Ecuadoran food, including rotisserie chicken and chopped salads, is about to be served in a totally redesigned building at 7524 Forest Hill Ave. Owners Patricia Castillo and Narcisa Garcia are completing installation of a 40-seat dining room for the counter service business, with lunch and dinner daily beginning in about a month. “It&apos;s fast and very moderately priced,” Castillo says, “and Latin American food that people don&apos;t usually get a chance to taste.” Look for Ecuadoran seviche with shrimp and Peruvian seviche with fish among other specialties. Buz & Ned&apos;s: After a change in personnel, construction is back on track at the former Fuddrucker&apos;s near Broad and Parham. Buz Grossberg says he&apos;s fully committed to the project, and work is proceeding for a second location of his Boulevard barbecue landmark. Plaza Azteca: This Tidewater-based small chain opens another location here in the Short Pump Shopping Center where cuisines now include Japanese, Italian, Spanish and American classic steakhouse, all within view of the Hilton Hotel. Stella&apos;s: On a quiet block of Lafayette, famed chef Stella Dikos plans to open a new restaurant based on her summer travels to Greece with daughter Katrina Giavos of the restaurant dynasty. Dikos is known for her slow-simmered soups, luscious Med entrees and pastries, and food-of-love matriarchy. Her Facebook page must be something. Read more about this project next week in Short Order. Mainstream is another new cafe coming to the Fan. Signs of life are returning to the corner cafe that briefly housed Cirrus and Plaza Mexico. Comfort's Jason Alley named a rising star chef in the region. It took a four-course tasting menu for chef Jason Alley of Comfort restaurant downtown to earn a new title. Bourdain wows Fredericksburg audience with Medium Raw, well done. Anthony Bourdain knows he&apos;s got the best job in the world. Conch Republic Rocketts, a new Key West-themed cafe, breaks ground Monday. Quite a number of local owners and chefs have talked about starting a new restaurant at Rocketts Landing. Most of those projects fizzled, but now one&apos;s apparently got staying power. Bob Cox, owner of Metro Grill and Curbside CafAc, is getting a sweetheart deal to open Conch Republic Rocketts at the urban community next year. He'll operate the business in their brand new building. A ground-breaking for the hillside project just east of The Boathouse restaurant is set for Monday. The building, designed by H&A Architects and Engineers, is a 6,000 square foot hillside contemporary with industrial elements. Its notable feature is a 2,000 square foot deck looking over the James River and the boat slips at Rocketts, beckoning business from the water and the city. It will serve lunch, dinner and brunch with entrees averaging $16, Cox says. The restaurant will seat about 220 people in a “fun, laid-back, very unpretentious, very casual Old Key West style cafAc and bar,” Cox says. The 49-year old attorney-turned-restaurateur spends at least one vacation a year in the Keys, and has been in talks with the Rocketts owners for more than a year about this concept. Conch Republic is named after an uprising of Key West residents who seceded from the U.S. to protest heavy-handed border patrols in 1982. Now they celebrate independence day every April 23. Cox expects to celebrate those renegades here as well, once construction is finished next spring. Xtra's Cafe open in Carytown. Check the balcony. Xtra Moore, a well-known local bartender, finally gets her own place and the crowds to go with it. Xtra's Cafe, poised above Bangles & Beads at 3322 B W. Cary St., brings a curving balcony to the street with room for a dozen patrons who can smoke there after dinner. Inside, the bright space seats about 80, with a Mediterranean-meets-West Coast menu of small plates such as a savory creme brulee, a mozzarella poutine with chicken gravy, hearty salads and house-made desserts. Ten taps, an under-$10 wine list, cocktails and cheerful service are the draws. The business is open daily from 11 a.m. until 2 a.m., a rare late-night option in Carytown. 355-0446. Follow Style Weekly for food news. Switch-up at LuLu's in Shockoe Bottom. Millie's Diner owner Paul Keevil has taken over operations at the Shockoe Bottom spin-off LuLu's; former partner Steve Jurina is no longer involved at the restaurant. Tweaks to the menu, cocktail and wine lists and service team are taking effect over the next few days, says new general manager Kirsten Hansen, who returns to Richmond after stints as a wine rep and at Greens in San Francisco. Here, she's bringing wines "with the best bang for the buck, as little mark-up as possible," she says. "I want to get people excited about wine and the lesser-knowns as well as the familiar." Hansen notes Richmond's increasing interest in learning more and tasting more wines and hopes to capture that through a list mostly in the $25- 44 range. Fancy snacks at the bar will bring something different to weeknight happy hours, including sausage-stuffed fried olives, bacon-wrapped dates and truffled popcorn. Dinner entrees new to the comfort-food menu will include seared duck breast with wild mushroom hash and a fig glaze, and house-made goat cheese tortellini with mussels in spicy tomato sauce. Small changes to the industrial decor "will make it more cohesive," Hansen says. See Style Weekly for more details. Positive Vibe Express now open downtown. Chef Frits Huntjens is overseeing the new counter-service business Positive Vibe Express, now open in the lobby of the Library of Virginia at 800 E. Broad St. He's making sure breakfast and lunch dishes are something special, from fresh herbs and local ingredients to enticing new recipes for salad and sandwich basics. The chicken salad has a touch of curry, apricots, raisins and pineapple. The crab and corn cakes with remoulade are topped with local microgreens. Hot breakfast includes scrambled eggs and sausage. Best of all, the business supports two non-profit missions -- the library's and the Vibe's training program. Business continues to be strong at the Vibe's mothership location in Stratford Hills, where Huntjens' contributions are paying off handsomely in food quality and interest. Positive Vibe Express is open Monday through Saturday from 8 a.m. until 3 p.m. See details in Style Weekly.